The Arizona Motor Vehicle Division (MVD) is in charge of issuing driver's permits to all first-time drivers. Graduated restricted driver's license/provisional license. Continue reading this page for information about obtaining your instruction permit and graduated driver's license. The first step of the graduated driver licensing process is to apply for your Arizona learner's permit. You must be at least 15 years and 6 months old to apply. 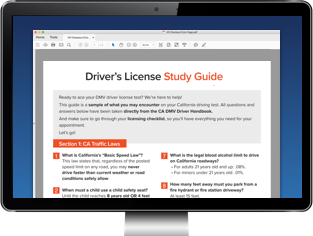 Don't leave your permit test to chance—take our free permit practice test with questions directly from the AZ driver handbook. It's the fastest, easiest way to set yourself up for success! Submit a completed Driver License/Identification Card Application (Form 40-5122). If you are under 18 years old your parent or legal guardian's signature must be notarized or witnessed by an MVD agent. Show proof of your identity, age, and legal U.S. presence. Pass the written and vision tests. Pay the $7 learner's permit fee. Your learner's permit will be valid for 12 months. NOTE: You can’t get a learner’s permit or provisional license in a Voluntary Travel ID format; you must wait until you have a full, unrestricted license. However, you can apply for a Voluntary Travel ID identification card until then. NOTE: If you have an out-of-state driver's license, the AZ MVD does not require a written test in most cases. However, your Arizona MVD representative will decide. The written permit test in Arizona contains 30 questions (all multiple choice) at your local MVD office. To prepare for your written test, you should read the Arizona Driver Manual and try the basic practice test provided by the MVD. If you want to ensure passing on your first attempt, we suggest an online practice test from our certified partner. You have 3 attempts to pass the written permit test within 12 months of applying for your Arizona learner's permit. If you fail 3 attempts at your exam, you will need to pay your application fees again. With your graduated Arizona learner's permit, you may only operate a vehicle while supervised by a licensed driver who is at least 21 years old and seated next to you. Complete an AZ driver’s education course through your high school or a professional Driver's Ed program. Complete 30 hours of supervised driving, including 10 hours at night. 30 hours of instruction in the classroom. 6 hours of behind-the-wheel driving instruction. Have held your Arizona learner's permit for at least 6 months. An MVD-approved driver's education program. 30 hours of supervised driving practice, which includes at least 10 hours at night. Submit a completed Arizona Driver License/Identification Card Application (Form 40-5122). Show documents to prove your identity. For a complete list of documents, please visit the AZ MVD website. Pay the $25 graduated driver's license fee. For information about applying for your Arizona driver's license, please visit our Applying for a New License (Teen Drivers) in Arizona page. Apply for an Arizona driver's license, learner's permit, OR identification card with the MVD.